Austin was not big enough to hold all its grief on May 18, 1978, when two authority figures- a policeman and a schoolteacher- were shot to death hours apart while doing their jobs. 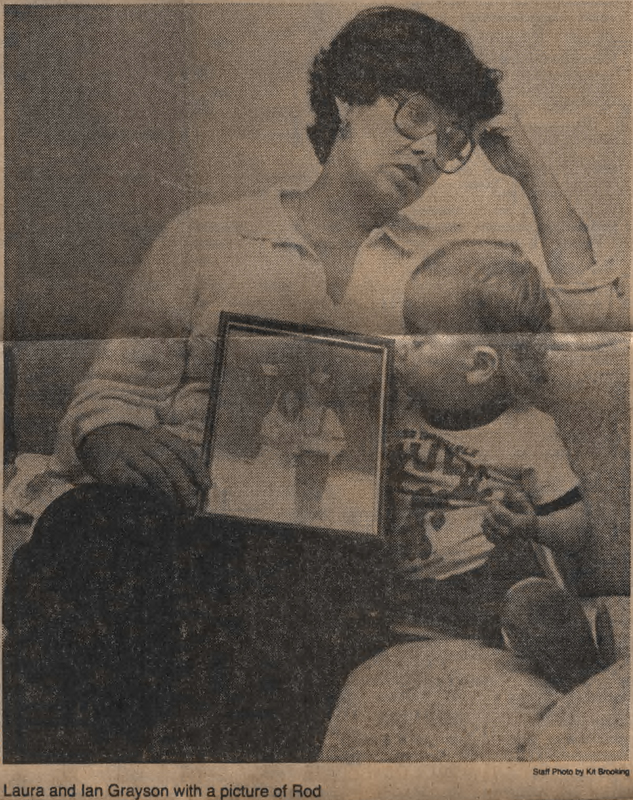 The murder of Ralph Ablanedo of APD made news all over again in June 2010 when his killer David Lee Powell was executed. But much lesser known is the case of Murchison Middle School teacher Wilbur “Rod” Grayson, who was shot to death with a .22-calibre rifle by 13-year-old student John Daniel Christian. Witnesses said Grayson, 29, a first-year English teacher, was sitting on a stool when Christian entered the classroom, raised his father’s rifle and shot Grayson three times. The story was huge news at the time, but has been scrubbed from Austin’s conscience through the years. The young killer was the son of George Christian, former White House press secretary under Lyndon Johnson. John Christian spent 17 months in a psychiatric hospital and recovered his mental faculties to the point that he finished law school at the University of Texas and is currently a lawyer in Austin. 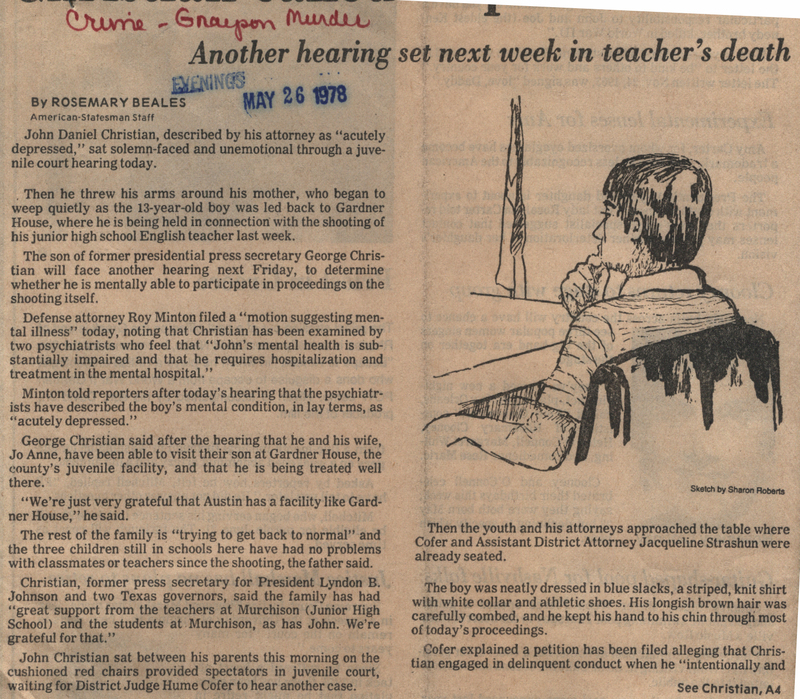 At John Christian’s 1978 hearing, a pair of psychiatrists testified that the 8th grade honors student suffered from latent schizophrenia and that putting him in a juvenile detention center would only increase the severity of his mental illness. Christian told doctors he didn’t single out Grayson, despite reports that he was angry about a failing grade. Newly elected Democratic district attorney Ronnie Earle wanted to have Christian, too young to be tried as an adult, sentenced to five years at a reform school. But he didn’t offer any evidence to contest the motion by defense attorney Roy Minton to declare Christian mentally ill. When Christian came into the classroom with the rifle on May 18, 1978, Grayson didn’t initially take him seriously. “The joke is up,” the teacher said, then Christian shot him in the head, chest and arm. Christian’s parents paid $129 a day for him to be treated at Timberlawn Hospital in Dallas, where he remained for a year and a half before living in foster care with a doctor. John Christian graduated from Highland Park High School in Dallas before college at UT. In 2010 his sister declined to pass along an interview request. Grayson’s widow, a teacher at LBJ High at the time, settled a lawsuit with the Christian family in 1981 for an undisclosed amount.